Last year the Coalition announced they were going ahead with an unsolicited proposal: to upgrade the Dandenong line. In summary, it included: grade separation of 4 level crossings, 3 stations associated with those rebuilt, planning and early works on 5 more grade separations, high capacity signalling, 25 new trains, a maintenance depot at Pakenham, and power upgrades. On Tuesday the Labor government announced that they’d scrapped the Coalition’s plan, and were going ahead with a bigger version: grade separation of 9 level crossings, 5 new stations rebuilt, 37 new trains, a maintenance depot at Pakenham, power upgrades, and a high capacity signalling trial on the Sandringham line instead, ahead of a rollout across the rest of the network. By most measures, the Dandenong line is the most crowded on the network, and is likely to get worse as it serves a growth corridor. Unlike the western suburbs lines, which are about to get a boost via Regional Rail Link, to date there’s been no substantial work undertaken to relieve it. 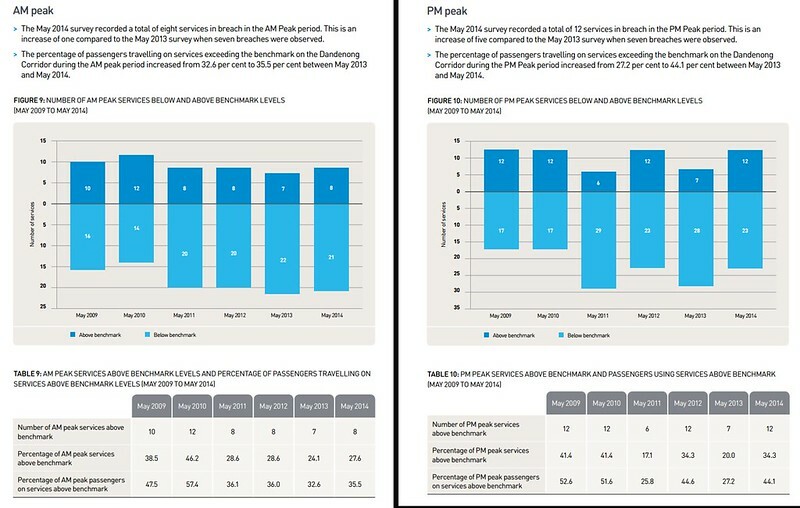 Timetable changes a couple of years ago provided some relief, but the May 2014 load surveys showed that in both AM and PM peak, crowding has got worse in the past year, with 35% to 44% of passengers travelling on trains above the “benchmark” crowding figure. What’s in the revised project? Level crossing grade separations: Coalition 4; Labor 9: the revised plan will see removal of all the level crossings between Caulfield and Dandenong, making the entire line from the City Loop to Dandenong crossing-free. Note that all the crossings were on Labor’s list of 50 that they took to the election. One thing evident from last year’s plan (and from the completed rebuild at Springvale) was that it was to include some planning for future track expansion. I’m told this is continuing. They are working out where extra tracks could go in the future, and not necessarily demolishing buildings right now (pointless if the land may not be needed for decades), but certainly not allowing new ones up that would get in the way. You might see carparking or other uses for the land, but no new buildings — similar to VicRoads and their overlays in places like Punt Road. Station rebuilds: Coalition 3, Labor 4. No surprises here; it’s the stations that are adjacent to level crossings being removed. More crossings removed = more stations need to be rebuilt. Existing stations will also get minor modifications: short platform extensions to handle the slightly longer trains. New trains: Coalition 25; Labor 37. These will be a new design, a so-called “high capacity” model, carrying 20% more passengers than the current models. They’ll be a bit longer than the current 6-car trains, probably fitting more snugly into the platforms in the City Loop. I’d expect they’d have more doors, more efficient seating layouts, and no centre driver cabs (largely unused these days). The key change is the number — 37 will be enough to run the entire Dandenong/Cranbourne/Pakenham line with one train type, meaning more consistent running times and loading times. As I said at the time, 25 wasn’t enough; it would have been messy running a mix. Maintenance depot at Pakenham: It makes sense to have a depot out at the end of one of the lines, so the new trains don’t have to travel long distances out-of-service for maintenance. It also helps support local jobs, which would be welcome for the area. 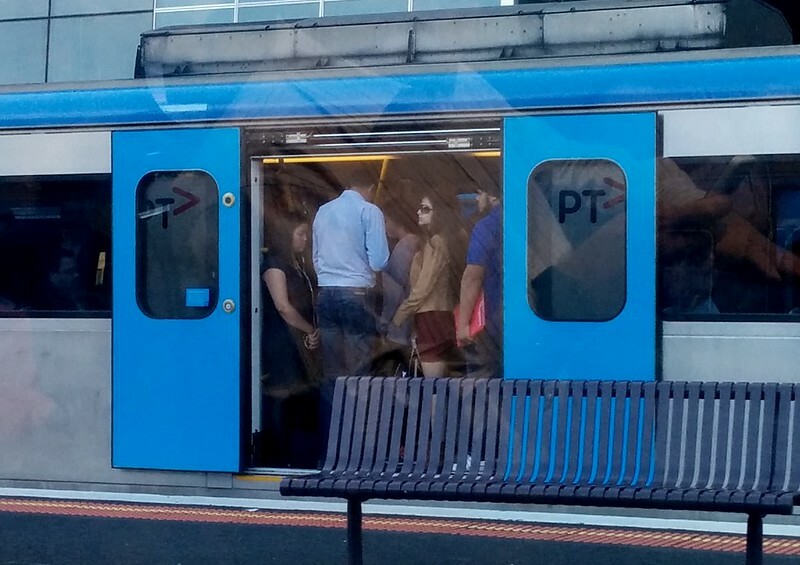 Signalling: We’re back to the PTV plan for the Sandringham line to get the first trial with High Capacity Signalling (also known as, depending on precisely what you’re talking about, moving block, or Communications-based train control — CBTC for short). That line is almost completely isolated from the rest of the network, particularly V/Line and freight trains, so it will be easier to test the technology with a lower risk of a huge SNAFU taking out a whole rail line. It will mean whatever trains will run on the Sandringham line will need HCS equipment, though it’s unclear if that would include a dedicated fleet. Perhaps more likely it’ll be modifications to existing trains, with enough flexibility that they’re not tied to that line. The wish to trial HCS first might be related to the delay in the emergence of a definitive standard for this type of technology, and rumoured disagreements between the various players about precisely which technology from which company should be adopted. It’s a complicated area. It’s important to note the Dandenong line will still get a signalling upgrade. It won’t be HCS/CBTC, but it will be modern conventional signalling. The view recently (such as on Regional Rail Link) has been that when a line is rebuilt (as parts of the Sunbury line were), the ageing electrical and signalling equipment is ripped out and replaced with new stuff, which is more reliable once installed, and has better provision for future upgrades. I’d assume we will see the whole line from the City to Dandenong allowing a train every 2 minutes (currently 3 minutes). Usually the practical maximum is 80% of the theoretical capacity, so that would allowing about 24 trains per hour — currently the line has about 15 + 2 V/Lines in the busiest hour. Of course a rail line runs most smoothly if no messy junctions are used on the most frequent part of the network. The logical consequence of this is that the remaining Frankston Loop trains will be altered to run direct into Flinders Street, but this hasn’t been specifically stated yet. I wonder if consideration has be given to a flying junction (that’s gunzel talk for grade-separated) where the Cranbourne and Pakenham lines meet? I’m told V/Line trains will continue to run all the way into the City. No current plans to terminate them at Pakenham. The upgrade is independent of the Metro Rail Tunnel project. I’m not sure exactly how they calculated it, but the government say the changes will boost total capacity by 42%, even without the tunnel. Indeed, the tunnel really only increases usable track capacity from the west, though given the Dandenong line would use it, it would allow the Frankston line back into the Loop. The government claims delivery of the various upgrades would be in the period 2016-2018, which sounds quite ambitious to me. No doubt they want things well underway or preferably finished by the 2018 election. Much the same as last time. Duplication of the Cranbourne line, which still has about 10km of single track. It hasn’t been included in the project scope, but must be done if cascading delays are to be avoided. It’ll be a ridiculous situation if billions is spent, but a single little delay near Cranbourne can still easily jeopardise services on the whole line. Also missing is any word of a revamp of connecting bus services, with more Smartbus-like services feeding into the stations. The key to having a rail line live up to its potential is ensuring people can easily get to the stations. The emerging pattern now is for PTV to embark on this type of upgrade when new stations open. But given the various upgrades in this project will be introduced in stages, there’s no real reason such a revamp has to wait. Indeed, given some stations will lose parking during rebuilds, it might help ease the pain of disruptions during the project. As the Urban Melbourne web site points out, the other thing missing is something specific on land use planning around stations. There’s an opportunity for more development, particularly on big slabs of land currently taken by car parks (where it wouldn’t take space needed later for track expansion). Labor’s made some interesting claims as part of justifying the change of plans. Firstly they allege the Coalition secretly removed HCS from the project scope in October (eg before the election), due to cost blowouts, and they claim to have a letter proving it. Secondly, they’re citing concerns with the unsolicited proposal process, including the prospect of Metro (MTM to be precise) being franchised to run the Dandenong line well after their contract for the rest of the network might have expired and another operator possibly appointed for the rest of the network. That could have been messy — the old days of Connex and M&Train led to issues. And there were concerns about the cost to taxpayers of the ongoing payments to MTM over the life of the contract, relative to the project cost. On the face of it, the outcomes for train passengers and road users from the revamped version are better, but the devil will be in the detail. And let’s hope the government works hard to make sure the outcome for taxpayers is good as well. Next → Next post: How many WiFi devices are in your home? Is there space to put the railway under Heatherton Rd without rebuilding Noble Park? If the Frankston line is being taken out of the loop, which is reasonable for capacity and sectorisation reasons, then cross-platform transfer at Richmond, like on the Burnley group, should be considered. Dropping cross platform transfer from the original City loop design between the 1969 Melbourne Transportation Plan and the actual building was a mistake. This would however need a flyover between Flinders St and Richmond and another between Richmond and Caulfield. ** Chandler Road was not part of the original 50 crossings list in the previous election. It would be good to see that done none the less. I know of someone who uses that crossing on a regular basis, and needs to wait for 10 trains sometimes. ** There is already an urgent need for two express tracks between Dandenong and the city, in respect to freight trains and getting freight off the local roads. This should be done part of any upgrade to the corridor. This shall also remove all V/Line trains from the Metro tracks too (Between the City and Dandenong). There is really no need to have a more modern signal system, the current set up can already handle 2 minute headways all the way out to Dandenong. If a particular signal mast is about to fall down due to rust, then we need to replace that mast, may as well go for all new components while we are there. ++ Grade separate all between Caulfield and Dandenong, perhaps one or two others beyond. ++ Longer trains with more room. ++ A proper 6 car set, without that ‘waste of space’ as you get with a double consist. On the matter of the Sandringham line signal upgrades, why do we need a new type of system anyway. The current signals can provide a 2 minute headway. The only upgrade I want to happen is TPWS to be standard to the suburban fleet and network. I do hope that at least we can agree to one common standard, that can also be ‘open source’ so we are not stuck with the same party forever. Before I conclude, may I wish Daniel, and everyone who posts in here, a very happy Easter. Thanks for the summary. The Dandenong corridor certainly needs all crossing removed. While my extreme cynicism usually comes to the fore, I think the government’s train planning is quite good. Maybe it is listening to public transport experts as to how to get best bang for a buck. One thing I find not mentioned much is the loss to the heritage value of Murrumbeena and Carnegie stations. Hughesdale is no major loss it’s just a concrete slab island platform. We all know these two stations just going to get drab, grey, prison like station. The existing station building creates a really nice village feel and continues to serve the area well with new entry/exit points. I don’t think there has to be tension between “benefits overall” and “removing these stations”. It’s just the easy option to destroy the station without respecting heritage. The plan is not ambitious enough. Considering growth forecasts and extensions to the railway line. They need to quadruplicate the Dandenong railway line before extensions can occur such as this and the proposed Rowville railway line. At least four tracks to Huntingdale station and three tracks to Dandenong to allow express services from these outlying suburbs. While also allowing freight and regional services to share the railway line and the Rowville line to be constructed. Or diverting tracks to the Alamien line via Chadstone from Oakleigh. There is also this article in Urban Melbourne that people may be interested to read. Tweaking the trains to increase per train capacity by 20 per cent won’t go far in light of likely demand growth. Another option would be to run 9-car trains from Dandenong to Werribee. Frankston trains would go to the Caulfield loop. To avoid conflicting movements you would need to convert City -Caulfield to up-up-down-down running with a new flyover just south of Caulfield to take the down Frankston line over the Dandenong lines. Up Frankston trains would run to the Caulfield loop anticlockwise at all times, thus diving under the Dandeng lines between Richmond and Parliament. There would be same direction crossplatform interchange between loop and Flinders St direct trains at Richmond platforms 3-4-5-6 in the same way that the Ringwood lines have at platforms 7-8-9-10. This is a significant benefit. Extending platforms at Flinders St and Southern Cross would be complicated but is certainly doable. At Richmond you would extend the platforms west, replacing the western underpass with an over bridge. Elsewhere extending platforms would be straightforward. I guess this would cost in the hundreds of millions. But by increasing capacity much more than the stretched 6-car trains option, it would postpone the need for high capacity signalling. Platforms in Melbourne are 160m. Railway stations on the new Crossrail tunnel in London will be 250m in length to accommodate 200m trains that will pass through each station, as well as enabling longer 240m trains to operate in the future as passenger demand increases. We need to replace all the roads with just one arterial say, Boundary road to be extended due north in one four lane road. That would be a lot cheaper than doing the railway line. There is quite a lot more I would love to say in respect to this, but this is Daniels forum. Although I may add some more comment here over the next few days. Extending East Boundary Rd straight north is a terrible idea. That would mean ploughing a major road through housing. Hundreds of houses would need to be acquired, at a $million or more per quarter acre and as such lowering the railway would likely be cheaper. The political cost to the government of such a plan would be high, and justifiably so. That part of Carnegie would become significantly less pedestrian friendly. It would also mess up the bus system and the shopping centres at the other stations. So, I’ve been working on this sort of proposal for about eight years now. Good to see the signalling trial moved back to the Sandringham line. I’d be interested to learn whether the new system will be cross-compatible with TPWS, and if so the existing installations at Flinders Street and Dandenong. We also need to be clear in aiming for four tracks from Caulfield, not just two or three. Though to be fair, in the short term four tracks to Oakleigh/Westall plus extra trackwork around Dandenong and turnback sidings per Watergardens at Pakenham. If the grade separations between Springvale and Dandenong are going ahead then it’s almost certainly more economic to lay tracks three and four as part of the same project. The risk with buying “high capacity” stock, implying genuine metro stock, is that it’s not intended for trips over such long distances. The whole idea of commuter stock (Tait 201BT, Harris and later fleets) in allowing more sitting and less standing room was a response to lengthening trips over the decades, where the ideal solution would be retain short-length commutes by encouraging growth in cities other than central Melbourne – Dandenong, for example. Commute times could be cut to a third if the majority of people between, say, Westall and Pakenham/Cranbourne travelled towards Dandenong station instead of all of those people going into Flinders Street / Parliament. As far as I’m aware there has been no talk of flyovers on the down side of Dandenong station, probably because there’s more than enough room to come up with a solution when that becomes necessary. The problem is at Caulfield, where ideally we’d end up with the four tracks from the city end (up-up-down-down, express outside and stoppers in the middle) splitting into four+four, allowing both stopping and express trains in both directions (and offpeak, freight, empty transfers etc can use the express tracks). Otherwise we’ll end up with three from Moorabbin merging (allowing some trains to run faster, but no actual extras once we reach maximum capacity on the outbound line plus sidings in the CBD), and probably four between Carnegie and Yarraman with the capacity constraint being on the city side. Any type of signalling will work best when all trains are running at the same speed, which is a considerable part of why the sorting of express/stoppers city side of Caulfield has done wonders for reliability. Headways are based on train stopping distance at a given maximum speed, so Xtrapolis at 90 km/h should be good for considerably better than one every two minutes, but only if every train has the same length and deceleration characteristics, which means throwing in loco-hauled trains (freight and V/Line) throws out the balance, as well as any form of express. This is why in-cab signalling is superior – it allows the headway to be calculated based on the parameters of the individual train, rather than being adjusted for freight trains and keeping electrics further apart than they need to be. Re Metro tunnel capacity, I’m glad to finally see someone acknowledge that it has little to no value to the Caulfield Group (and limited value to the Northern Group, post Cross-City). I find it interesting that nobody, yet, has proposed taking the V/Line services only as far as Dandenong (which is more of a destination than Pakenham, and the trains have to drop-off there for some reason, after all), and/or adding a new island platform on the south side of the yard. Cranbourne duplication, or even loop extension, isn’t really critical as long as the line stays its current length and until the Dandenong South freight terminal is built. Cascading delays are a risk, but probably manageable by having a spare train at Dandenong to take over for a late-running Cranbourne citybound train. My understanding is that, at Heatherton Rd, the plan is to have the line drop about six metres and the road elevate two, very similar to Middleborough Rd. Of course I’d like to see an elevated rail solution, with all sorts of benefits in terms of pedestrian permeability and possibly half the construction cost. The Murrumbeena footbridge could be donated to a heritage railway, and the various station buildings could be repurposed as bus shelters on Koornang, Murrumbeena and/or Neerim Roads. Can I get more detail on this proposal , is this extending the road directly north or adding a carriageway to Murrumbeena rd (similar to Westall Rd ten years ago). What does not ‘doing’ the railway line mean not removing the level crossings or changing its scope. Also a question for Mr Stosser, do you think if quadding were to be implemented in the future between Westall and Caulfield would they need extra tracks past Caulfield towards the city and flyovers at Caulfield junction with the line to Frankston. In terms of working on this project for 8 years was this professionally and do you know anything about the cancelled triplication that was proposed for the line. @Jim (first comment), yes Chandler Road was pledged by Labor in their 50. It was not fully funded by the Coalition as part of their version of the Dandenong project. Correct, Sandringham doesn’t necessarily need HCS – the point is to trial the technology. @wxtre, I reckon overall 40% increase in peak capacity is a good start. Quaduplicating is only really useful if one is planning for lots of express services, which isn’t really the immediate priority. @John, each train might carry 20% more, but that can’t be considered in isolation. As I understand it, the plan would be for longer (9-car) trains later in association with the metro rail tunnel. @Jim (second comment), no, major road widening won’t help us, and as Tom notes, extending East Boundary Road northwards would destroy the neighbourhood. Overall road capacity isn’t the main issue — the level crossing is. @David, good point about seating for long journeys. They’ll have to take care with the designs. The concept I’ve worked out in my spare time involves a flyover just east of Batman Avenue to connect Flinders Street platforms 8/9 with Richmond Platform 6; then up-up-down-down running to Caulfield with a grade-separated junction at the down end (1:53 gradients starting in line with the current end of Platform 4, adjust alignments of other platforms for clearance and close Queens Avenue underpass, consider replace with horseshoe bridge per Perth over the southeast end of platforms). Each of the four tracks through Caulfield station would have a junction at the end, and immediately after that, the four Dandenong lines would elevate and the four Frankston lines would drop down, to give the required four-over-four clearance. With the exception of Neerim and Glenhuntly Roads on the Frankston line, elevating the rail line over all roads would give the smoothest grade chart for freight trains. There are up to 6x spare paths for peak trains which would thread between everything else with creative track and express allocations, plus if necessary any paths freed by shortened V/Line trains and/or a ban of peak-direction peak-hour freights, per Sydney. Trains would be fairly evenly spaced for the inner portion, but I’ve had to put some overtake moves in at Westall and Dandenong, so for example the arrivals at Pakenham change from 10min to 6/14/6/14 cycles. I don’t actually *know* all that much about older proposals for triplication beyond Caulfield, though I have some theories about its proposed development. There are papers available online detailing the proposed third track to Mordialloc, and I gather the panel installed at Oakleigh in 1975 was designed to control Carnegie through Yarraman including Rowville, but the extra functionality never got used (and the panel’s in a rather sad condition now so it probably isn’t capable of being upgraded anymore). re:wxtre, it’s cheaper by economies of scale to lay tracks three and four as part of the initial project, rather than going back and having to add them later. re:John, also worth keeping in mind that apparently the underground Metro tunnel stations will have limits in terms of people throughput. Eventually we could hit the same limit as at Parliament, with too many people on platforms causing a safety risk and/or trampling-in-crisis risk. re:me, my point was that vehicles in general can either be designed for high capacity, uncomfortable but not a problem over short journeys, or they can be designed for comfort over long journeys. Trying to do both with one vehicle is what landed us in the current mess with the Siemens fleet (and to a lesser extent, the others). The only long-term solution is to shorten average journey lengths through urban planning strategies, then provide a Metro-style high capacity fleet for the majority of trips and have a separate low-capacity/high-comfort system for linking the multiple urban centres. @Daniel In Sydney and London the mainlines have 4 tracks. Also the RRL in the west has 4 tracks. In the outer suburbs there is a need for fast express services and increased freight. 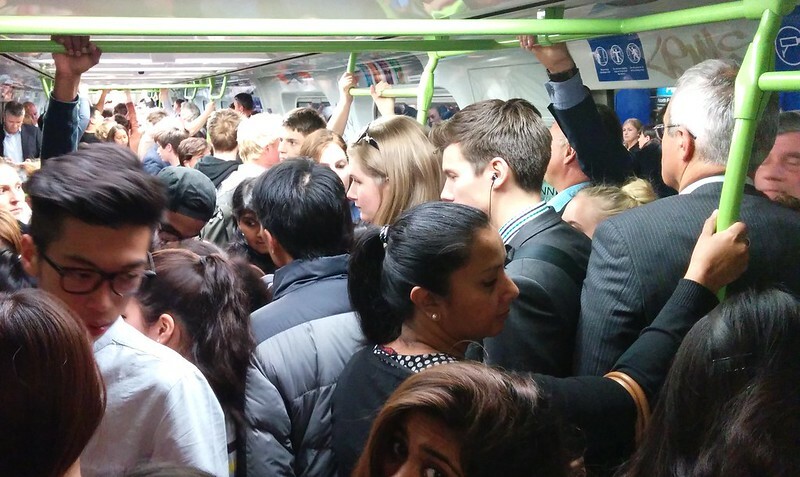 The Dandenong line is the busiest in Melbourne . And another commenter said it is difficult to retrofit it. It looks good to me is this an improvement over the previous services and if so by how much. Huh? How do you figure that those trains had more sitting room and less standing room? In fact, they /reduced/ the numbers of seats and increased the amount of standing room. A complete one? Or just the trains in one direction? Doing it in one direction is relatively easy, because you don’t need to worry about trains in the other direction getting in the way, such as using the same platforms and at flat junctions. 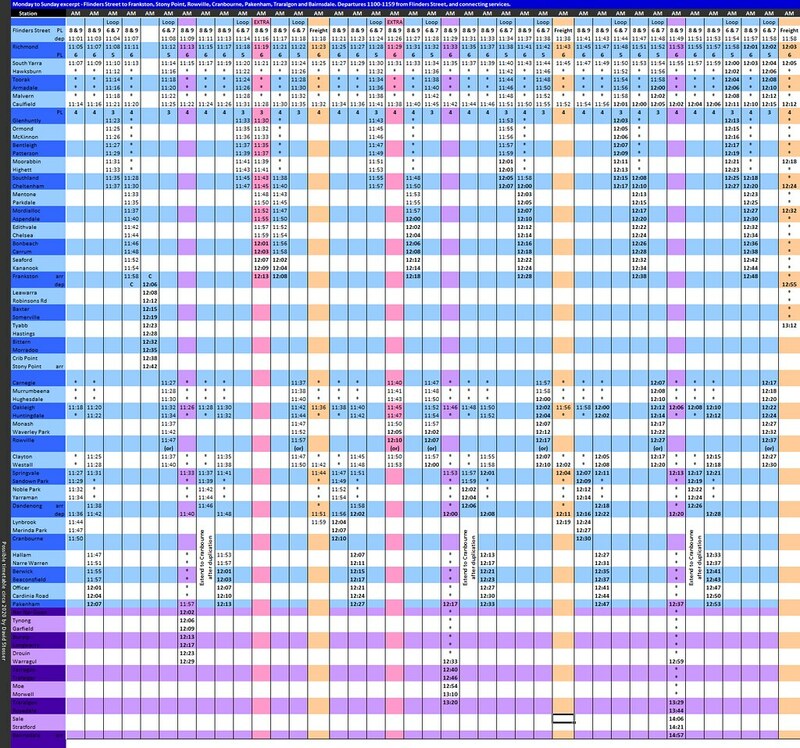 I have indicative train graphs with roughly two-hour slices covering the Caulfield and Northern groups; without that I wouldn’t make such detailed claims :) It includes freight, V/Line and extra paths at regular intervals and I don’t expect all of those to be used, so the remainder can be handed over to peak expresses. I spent a week in Connex’s timetables department (including authorship of S.2659/08 and S.2663/08) for year 10 work experience and I’ve been self-teaching over the last seven years. If the necessary investments were made in terms of quadding and flyovers would MTM realistically implement frequencies like you have proposed? @Llib, I’m not an employee of MTM so I’m not in a position to say. I’d expect so, depending on the wording of the contracts. Now that’s something that I would’ve liked to have done for work experience! When you left school, you didn’t want to go back and work there? Or was that not possible? I was under the impression that the only way to get into timetables was to get a standard entry-level job, then wait for the right people to retire/die in the right order and eventually get into the position. That means I should be in that role in about 30 or 40 years, unless you know of a faster pathway? By the way, Daniel has my contact details, so I’ll ask him to forward my email address to you so that you can contact me. I could then send through my work re Caulfield train graph, because I have a lot of respect for you via reputation and I’d like to know your thoughts on the details. Would you be willing to have a look? @David Stosser 6/4 2.51: I don’t understand why you would want a flyover between Flinders St and Richmond. Convert Flinders St – Caulfield to up-up-down-down with Frankston on the outside. Down Frankston line flies over the Dandenong line just south of Caulfield. Up Frankston line dives under the Dandenong line from Richmond to Parliament. Frankston trains proceed to Caulfield loop, anticlockwise at all times. Dandenong trains proceed to Werribee. There are no conflicting movements. If I recall correctly, Frankston line patronage is stable. Amplifying the Frankston line tracks further is unlikely to be priority for a long time. – same direction cross platform interchange between loop and Flinders St trains at Richmond 3-4-5-6. – ditto at Caulfield, if a new platform is built on the south side to make double islands. – when Dandenong is tripled in future, possibility of running two peak direction tracks all the way to the city when there are spare paths on the Frankston line, without conflicting movements. Flyover between Flinders St and Richmond is to put expresses on the outside, stoppers on the inside for both Frankston and Dandenong. It makes more sense to sort by market/purpose than to sort by geographic region; splitting into speeds means both lines can get stoppers and both lines can get expresses, and you don’t need to worry about three-into-two ex Frankston and four-into-two ex Dandenong, at Caulfield junction. Abolishing conflicting movements isn’t enough to properly serve the passengers/market. Eventually, it will be necessary to have two tracks reserved for high-frequency metro services (genuine, not just the marketing term), and the other two tracks for peak hour expresses (start at current rates, reduce to stable 20min services over next 20ish years; demand should drop as urban centres Dandenong/etc become self-sustaining) plus empty car moves (as required) plus freight (up to 20min services 24/7) plus V/Line (long-term goal every 20min plus regional) plus tour trains etc. If Hastings gets the expanded Port and the freight trains run via Frankston, at least partial quadruplication will be necessary, and eventually, probably, quad for the full length. My design for Caulfield Junction assumed no change to structures on platforms a/c heritage, but major changes to the junction itself; the four platforms would terminate in line with the current end of PL04 (and extended at the up end to compensate), then all four tracks split into pairs, and immediately after the point frogs the Dandenong tracks elevate and the Frankston line tracks drop, at gradients of around 1:53 if my math is correct, taking into account vertical curves. The up Frankston express and down Dandenong Express, on the outside of the junction, could have much smoother gradients. This achieves a sorting of trains by market (which drives capacity, acceleration rates, headways etc), rather than by geography which doesn’t make all that much sense when you think about it critically. Say you’re at Malvern on the up and you’re not a gunzel, do you really give a damn where the train came from? David Stosser: Yes, I would be willing to have a look. OK. I was assuming a pattern similar to the present one in which, mostly, the all stops trains are Frankston. It’s a matter of marginal extra costs vs marginal extra benefits. What you propose seems to be a lot of costly extra structure for the rather small extra convenience of being able to run both Frankston and Dandenong trains express or all stops. Over that section you’re only looking at 3-4 minutes difference after all. Your proposal also requires timetabling Dandenong and Frankston together as one sector, which reduces the resilience of the timetable. In my proposal Dandenong to Werribee and Frankston to loop would be separate sectors. Any chance of a diagram on what you propose for Caulfield Junction even a simple line diagram. It looks like you can safely ignore the certificate error. Specifically: https://gilbertandsullivan.org.au/~smartpax/transportplan.pdf – page 16. At some stage we intend to copy the contents of the forum, as well as the records from TransportTextbook, over to a new host. Short term, resilience would be reduced, but long term after quadruplication is extended to Dandenong and as far as necessary on the Frankston line, you’d end up with one group of stopping trains and one group of express trains, which would only ever interact with each other at island platforms for transfers. The intent, medium/long term, is to run expresses say Dandenong-Clayton-Caulfield-South Yarra, which has a major saving over the current run, but the majority of time savings comes from higher service frequencies, reducing average platform wait time and therefore average journey time. Thankyou for the diagrams, I am surprised at the fact that it takes up very little space, any idea of costings including quadding in two phases 1 to Oakleigh and 2 to Dandenong. I’m not qualified to comment on costings directly, but my guesstimates indicate around 30-50% of the cost of the Melbourne Metro tunnel project, to get the ten grade separations (including Caulfield junction), four tracks to both Warrigal and South Roads, resignalling Caulfield-Richmond and the Richmond flyover. Have you heard any detailed time schedule for cranbourne pakenham rail corridor upgrade, I am trying to send email to PTV for more information, but no reply so far. If it is scheduled to operate by the end of 2018 together with level crossing between Caulfield and Dandenong, at least there should be detailed time schedule for the plan, such as when to rebuild four stations, when to upgrade signal, when to build Maintenance depot at Pakenham. Victoria PTV should learn from sydney metro to disclose more details as possible. “Construction will begin in 2016, with all nine crossings removed by 2018.” There’s a community update PDF on that web site from September which has more detail of the timing. There doesn’t seem to be much info on the non-crossing parts of the line upgrades so far. Upgrades to the Cranbourne/Pakenham line are being delivered by both Public Transport Victoria and the Level Crossing Removal Authority. The Level Crossing Removal Authority are removing nine level crossings and rebuilding four stations between Caulfield and Dandenong. Further information about the timing and progress of these works is on their website – http://levelcrossings.vic.gov.au/crossings/caulfield-to-dandenong. PTV will be delivering the new Pakenham East Train Maintenance Depot. This project is currently in Request For Proposal phase and we expect construction to start in late 2016. No detailed plans or designs are available yet as we are still in the planning phase. Keep an eye on our website as we will update it as we get more information.